Preservationist Says "Take Cities Off Life Support"
Lester R. Brown, founder and chairman of the board of Worldwatch Institute, has announced the formation of a new organization - the Earth Policy Institute. "During the year since I moved from President to Chairman of the Board at Worldwatch, I've had more time to think," said Brown. "Three things have become much more apparent. First, we are losing the war to save the planet. Many battles have been won, but the gap between what we need to do to arrest the environmental deterioration of Earth and what we are doing continues to widen. Somehow we have to turn the tide. "Second, we need a vision of what an environmentally sustainable economy - an eco-economy - would look like, a roadmap of how to get from here to there, and a continual assessment of progress in this effort. "The gap between what we need to do to arrest the environmental deterioration of Earth and what we are doing continues to widen." can be read by busy policymakers, and can be easily distributed on the Internet." The Institute plans to have three primary products: a book entitled Eco-Economy: Building an Economy for the Earth, a series of four-page Earth Policy Alerts, and similarly brief Eco-Economy Updates that identify major milestones or setbacks in building an eco-economy. Individuals who are interested in subscribing to the Earth Policy Institute's listserv to receive the Earth Policy Alerts and Eco-Economy Updates may do so on the website or by sending an e-mail to epi@earth-policy.org with a request to subscribe. After becoming the brunt of widespread criticism for rejecting both the Koyoto agreement and any meaningful effort to reduce greenhouse gas emissions, President Bush commissioned a National Academy of Sciences study of the issue. The resulting report, Climate Change Science: An Analysis of Some Key Questions, confirms that human-generated greenhouse gases in the atmosphere are causing surface air temperatures and subsurface ocean temperatures to rise. Assembled in a month by eleven top climate scientists (including seven members of the National Academy of Sciences, one of whom is a Nobel Prize winner), the report found that the warming trend would likely continue, cause sea levels to rise, and bring greater rainfall to some regions and drought to others. While admitting that global warming is "real," the Bush Administration continues to push for reducing investments in conservation and renewables and for increasing efforts to extract and burn fossil fuels. And to deal with the "real" problem of global warming, Bush is calling for more studies. Really. According to a Gallup Poll conducted May 7-9, Americans support several measures to deal with the current energy situation, including both new production and conservation. When asked to choose between the two approaches, more Americans select conservation than new production. However, the margin in favor of conservation has declined in recent months. The poll also shows that while there is much support for steps to mandate more energy efficient products - like appliances, cars and buildings - there is less support for investments needed to produce more power. Americans are divided over whether to increase the use of nuclear power, and they remain opposed to opening up the Arctic National Wildlife Refuge. When asked to choose between conservation and new fossil fuel production, 47 percent of the respondents chose conservation while 35 percent picked new production. The poll also found that 91 percent of Americans favor development of renewable sources, such as solar, wind and fuel cells. For more details, see the poll results at The Gallup Organization website. California Governor Gray Davis signed legislation earlier this summer that established a $500 million program to conserve energy. The new program provides 50 percent rebates to consumers who buy efficient refrigerators and air conditioners. It also pays the full cost of installing energy-efficient lighting in businesses. It provides $60 million to municipal power agencies to expand their energy efficiency efforts and $105 million for distributed generation projects using renewable energy and other clean energy sources. For more details, click here. For eight days in 2002, student teams will compete to capture, convert, store, and use enough solar energy to power "our modern lifestyle." Solar Decathletes will be required to provide all the energy for an entire household, including a home-based business and the transportation needs of the household and business. 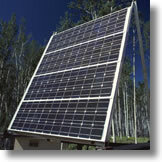 During the event, only the solar energy available within the perimeter of each house may be used to generate the power needed. Sponsored by the U.S. Department of Energy, the National Renewable Energy Laboratory, BP Solar, and the American Institute of Architects, the Solar Decathlon will involve transporting the student-designed houses to Washington, DC to undergo testing in ten specific categories during a week of public events and tours. Each team will have a website, provide house tours, and create print materials that explain the design, engineering, and operation of their house as well as the products and technologies being used in the house. For more details, visit the Solar Decathlon website. In the largest fleet transaction yet for its environmentally friendly Prius hybrid-electric car, Toyota will deliver nearly 300 units to the city andstate of New York for use in municipal and departmental fleets. "Prius, the world's first mass-produced hybrid sedan, produces up to 90 percent less harmful emissions than the average car on the road today," according to Toyota spokesman Jim Press. "In some cities, like New York, that means the exhaust coming out of the Prius is often cleaner than the air going into it." Hybrid vehicles use both a gasoline engine and an electric motor, switching between them to gain greater efficiencies. "A startling message from one of Michigan's highest ranking conservative leaders rocketed across email directories and fax lines of sprawl-fighting organizations last month. House Speaker Rick Johnson, a Republican from Cadillac, personally introduced a legislative package that actually forms a cogent statewide vision to manage growth, rebuild cities, assure clean water, and conserve farmland," writes Keith Schneider in an article on the Michigan Land Use Institute website. Explaining his proposal, Speaker Johnson says "As a northern Michigan farmer, I have a deep appreciation for this legislation. Land use and the environmental concerns that come with it will be vital to the continued prosperity of our state." To read the complete article, click here. Mayor Richard M. Daley has announced that the City of Chicago will make the largest purchase of clean power in the country when it signs an agreement with ComEd to supply 20 percent of its electricity. Under the agreement, ComEd will provide 20 percent of the City's power from green sources after five years, 10 percent in the first year. The amount of power is about 80 megawatts (MW), enough energy to supply about 80,000 homes. ComEd will buy the green power from other companies, initially companies that convert landfill gas into power, and within the first five years from sources such as wind farms and solar arrays. The cleaner energy will displace electricity produced by conventional sources. By the fifth year of the agreement, the air quality benefits will include 249,151 fewer tons of carbon dioxide, 1884 fewer tons of sulfur dioxide, and 1007 fewer tons of nitrous oxides. Under the agreement, up to half of the green power can be derived from methane that otherwise would be released into the atmosphere from landfills. Methane is 21 times more potent than carbon dioxide as a greenhouse gas. As a part of the agreement, ComEd will continually invest in the development of new green energy generation in the Chicago region. ComEd's profits from the sale of green power to the City - the increment above the regular electricity rate - will go into a Reinvestment Fund which in turn will help attract and develop new renewable generation within the area. "Take cities off life support and move them into the recovery room," National Trust for Historic Preservation President Richard Moe declared in a recent address before the National Press Club. Moe called on the Bush Administration to mount a major new initiative to spur urban reinvestment and revival. Moe proposed that the president bring together mayors, civic and corporate leaders, and nonprofit executives to identify how best to encourage greater private investment in urban America. He said the initiatives that emerge from such a meeting could restore the vigor and promise of America's cities. "No great nation can survive, let alone thrive, without healthy urban centers," said Moe, National Trust president since 1993 and a leading U.S. authority on sprawl and urban revitalization. "Now is the time to launch a focused national effort to take cities off life support and move them into the recovery room." "No great nation can survive, let alone thrive, without healthy urban centers." schools that serve as community anchors and learning landmarks. "Forging effective public/private partnerships, emphasizing the preservation and reuse of existing buildings, eliminating barriers and creating incentives for reinvestment are the tools that work," he observed. The Land Trust Alliance Pacific Program, the newest of six regional programs of the nonprofit Land Trust Alliance, will provide direct services, mentoring and technical assistance to the 127 nonprofit land trusts that work to protect open space in California, Nevada and Hawaii. The Pacific Program, with offices in Sacramento, CA, has entered the region as the issues of sprawl and land conservation are emerging as top concerns. The launch of the new Pacific Program comes on the heels of California voter approval of more than $4.2 billion in state and local taxing authority for open space protection. Nationwide, voters approved 83 percent of the 209 open space measures on the ballot in 2000, committing more than $7.4 billion in taxing authority and tax dollars to these efforts. Nonprofit land trusts have been tremendously popular and effective in the Pacific region. According to the National Land Trust Census, the most comprehensive and current survey of grassroots land trusts, California had 119 land trusts in 1998, nearly double the number that worked in the state in 1988 when 59 land trusts existed. As of 1998, local and regional land trusts in California had permanently protected 536,922 acres, nearly a fourfold increase when compared to the 140,492 acres protected as of 1988. Nevada and Hawaii also have experienced notable growth in nonprofit land trusts and land conservation. For more information, visit the Pacific Program website.